Trouble writing? Here’s what you need to know. I don’t know about most of you, but I know I’m struggling to write at the current moment. If you have been following me over the last few months, you’ll have noticed that I’ve been doing more Poetry recently rather than the short stories and articles. I was never really a fan of poetry, simply because I never really understood the differences from one to the next. However, the last couple of months has seen me write somewhere along the line of hundred or more poems across all sorts of genres/topics. Yet you wonder why I’m claiming I’ve been having trouble writing?! … I’m trying to do so many things all at once, because, let’s face it, whether by default or not, we writers and other artists are pretty much made to feel like we haven’t achieved anything in our respective realms of art until we hit the big stage. … Knowing that there is this added pressure to prove ourselves to not only others, but ourselves. We have got to let go of this grand self-criticism. It’s doing us more harm that good, occupying our brain space with junk, and hence we find time slips by without much notice, and before we know it, we are anxious, and this anxiety renders us helpless. I’d totally go and give late Mr Heller a big fat hug and a rigorous hand-shake for saying something like this out to the public, if I could, but writing about this is the next best thing I can do. Funnily enough, this satirical writer is greatly known for his book, Catch-22, which is undeniably a situation most people in the creative field find themselves. 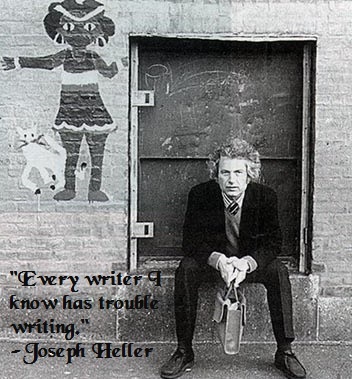 Joseph Heller is the father of the phrase now in constant use: catch-22. So, if you haven’t already, then take a moment, and let the quote sink in. Rather, let the meaning of it sink in. You are not alone, I and every other person out there who tries to write meaningfully has the same issue. But here is what you should ultimately keep in mind: it’s only trouble, it’s not permanent! You will write, I will write, hell, we all will write! Fingers crossed that the next time you come across, ‘Love Letter’, it won’t be in a photo, but actually be reading it here on the blog. 🙂 yes, I still write by hand!